Opened on July 16, 1963, the seventy-one kilometer section of the Meishin Expressway between Ritto in Shiga Prefecture and Amagasaki in Hyogo Prefecture is the first expressway completed in Japan. Expressways across the country now total sixty thousand kilometers in length—enough to make 1.5 trips around the world—and the network stretches from Hokkaido in the north to Okinawa in the south. Service Areas (SA) are places where travelers can stop to eat, get gasoline and take a quick break. Smaller Service Areas are known as Parking Areas (PA). In Japan, more than 550 Service Areas and Parking Areas are situated about fifteen kilometers apart on expressways nationwide, easily accessible at any time and place. In the past, Service Areas were not considered as travel destinations. They had little more than simple restaurants and shops, a gasoline station, and restrooms. Nevertheless, in recent years they have undergone a complete transformation and are no longer just places to stop for a break: they are now innovative multipurpose facilities. A wealth of servicesSoothe yourself in a warm bath—if you are lucky, even a natural hot spring—and then enjoy a lavish buffet breakfast. Wash your clothes at a laundromat, and ask the concierge for information about local tourist spots. Such amenities used to be associated exclusively with hotels, but are now available at some Service Areas. These establishments around the country strive to stand out and have consequently become fun places to visit while traveling. The most distinctive feature of these modern Service Areas is the food. They no longer simply offer souvenir packages of local foods and snacks; now there are farmers markets where travelers can purchase fresh, locally grown vegetables, fruit and locally caught fish. Restaurants serve meals made from local produce and offer gourmet delicacies for dessert. Specialty products from famous shops in the area—products not available anywhere else—are also sold. Many local residents also visit Service Areas by cars, using special entrances accessible from local roads. 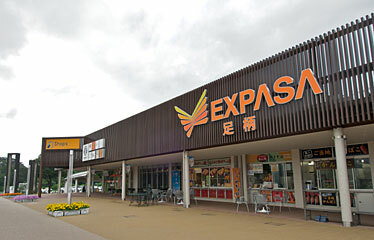 Service Areas thus serve as their shopping mall. Destinations to visitOne can enjoy the natural beauty of Japan that varies greatly from north to south when visiting Service Areas. 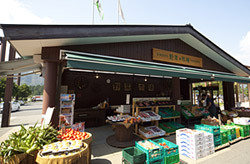 A Service Area in Hokkaido, a region of Japan famous for expansive spaces, has a large dog run. 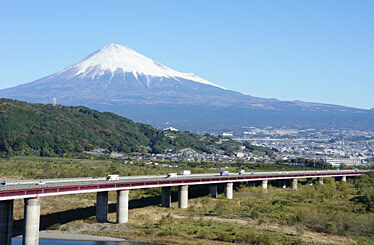 One in Shizuoka Prefecture boasts a view of Japan's symbolic peak, Mt. Fuji. An Okinawa Service Area overlooks the island prefecture's cobalt blue ocean; in Ishikawa Prefecture, there is a Service Area so close to the sea that you can take a dip in the water at the nearby beach. Modern Service Areas have so much to offer that they can easily be a trip destination. They are one more reason why traveling by car in Japan is a fun-filled experience.